Like most food we eat today, Moroccan cuisine is influenced by a fusion of neighboring culture and nations. The distinct flavors of Moroccan food can be recognized by a combination of spices like cinnamon, cumin, turmeric ginger, saffron, cloves, anise, nutmeg, and cayenne pepper. This particular genre of food uses an extensive variety of herbs and spices, bringing flavor and excitement to traditional Moroccan dishes like Tangine, Zaalouk, Harira, and Couscous. One of my personal favorites is Moroccan Lamb Chops. The very first time I tried lamb I was convinced that I did not like it. Unfortunately, the way that particular lamb meat was prepared turned out pungent and gamey, leaving an odd taste on my tongue that was hard to escape. It wasn’t until years later that I gave this intimidating meat a second chance and it was love at first bite. So, what is the difference between good lamb meat and less appealing lamb meat? Moroccan sheep breeds store most of their fat in their tails. The result is delicious meat without the pungent flavor that Western lambs tend to have. Good lamb meat should be tender and juicy, with a pleasant aftertaste. Unfortunately, not all meat is equal. I like to buy all of my meat, including lamb from Wholefoods market because there is a noticeable difference in flavor, texture and taste and ultimately what ends up on your plate. First and foremost Wholefoods never use antibiotics, growth hormones or animal by-products in the feed. Another benefit is the taste and freshness of the meat. The result is a healthier, better tasting dish on my dinner table. Because Moroccan flavors vary depending on the combination of spices used, I created my own Moroccan spice for this recipe using the spices I like best. 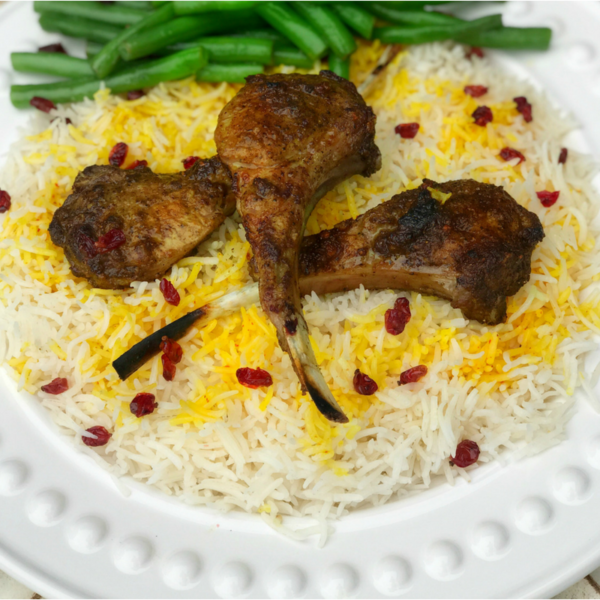 This recipe will give you enough spice to make a few batches of this lamb chop recipe. However, I prefer to double or triple the spice portion of this recipe when making it, so I have extra on hand for future use. You can use it on chicken, beef, fish, stews or even vegetables. Use your imagination and have fun! 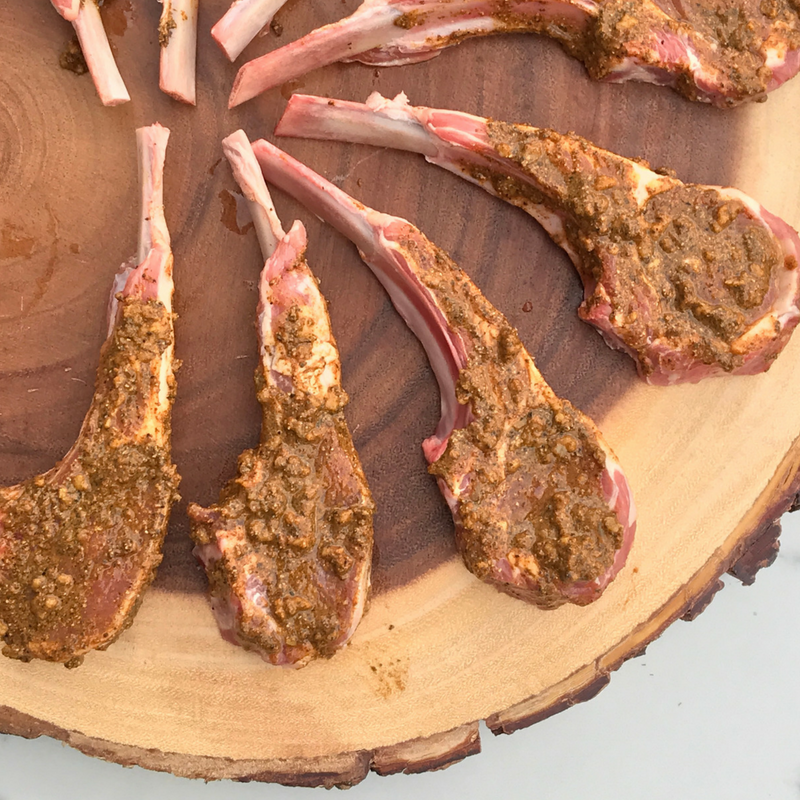 Be generous when coating your lamb chops with the spice mixture. Moroccan cuisine is known for an abundance of flavor, and because lamb chops are quite small, the taste should not be. 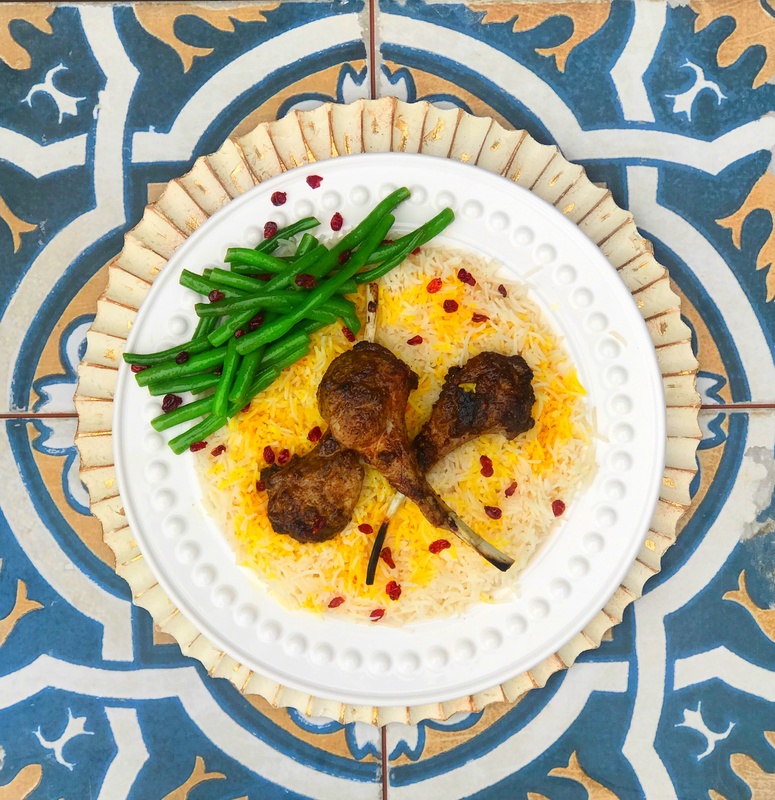 For an entire Mediterranean experience, three of my favorite dishes to serve with Moroccan Lamb Chops are Schloof, a Suryani Eggplant dish, Israeli Bulgar, and Chickpeas, and Garlic Green Beans with Shallots and Barberries. They pair perfectly with lamb and make an excellent choice for this dish. 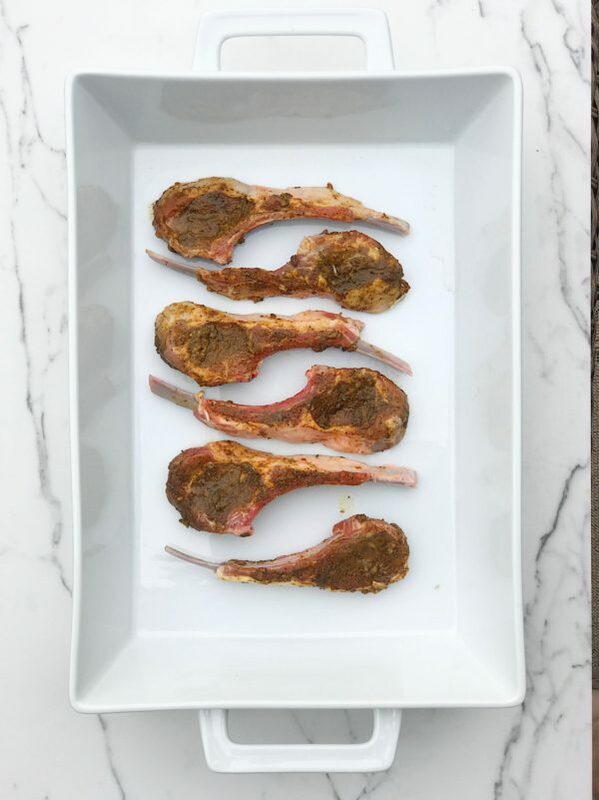 Moroccan Lamb Chops are small tender lamb chops coated with a unique blend of pepper and spices that bring the perfect touch of exotic Morocco to your dining table. Combine black pepper, ginger, cinnamon, turmeric, cardamom, cloves, and nutmeg in a small bowl and stir together until blended. Stir in lemon juice and olive oil until blended. Rinse and pat try lamb chops. Coat front and back of lamb chops with spice blend and transfer chops to an oven proof pan and place in the refrigerator to marinate for 1 hour. Place pan in the oven and broil 4-6 minutes on each side or until internal temperature reaches 145° for medium rare, or 160° for medium, depending on how you prefer it. Remove from oven and serve with immediately. 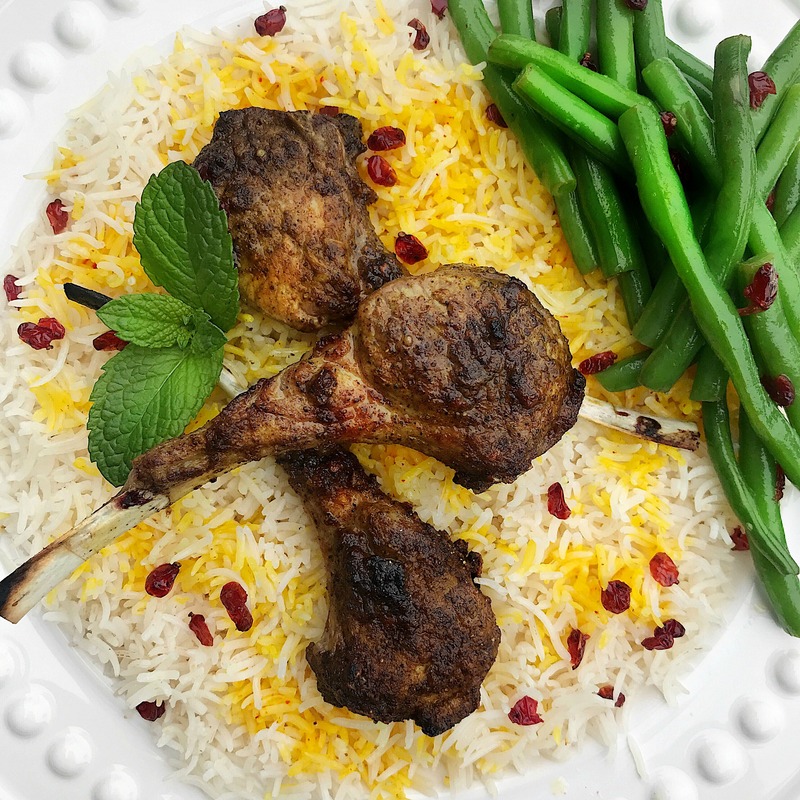 Serve Moroccan Lamb Chops with Persian Basmati Rice, Israeli Tabouli, or your favorite salad.